If you have been following me for awhile now, you might now that I have spend some time in Manchester while studying there. Manchester has grew into my heart and I was so pleased to be always back in the city. It is definitely a place where I always want to come back to explore more! Besides of London, Manchester can offer the same thing and enjoyed my time there to the maximum. Now, I would like to share with you some places and suggestions what to do for a weekend (or less or more days) there. 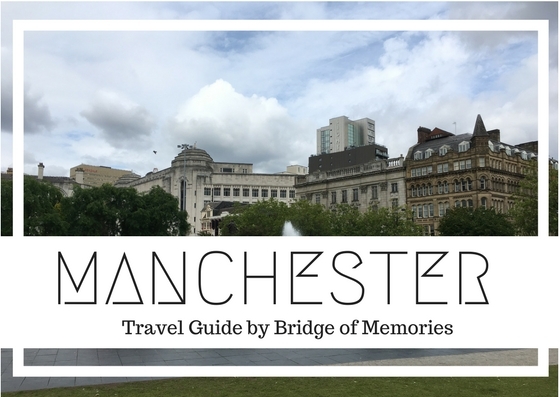 What to see in Manchester? Albert Square is a large public square in the centre of Manchester, dominating by its largest Victorian Gothic building - The Manchester Town Hall. On the square you will find number of monuments and statues, including the Albert Memorial, a monument to Prince Albert, prince consort of Queen Victoria. The square was named after the Prince Albert. The John Rylands Library is a late Victorian neo-Gothic building on Deansgate which was opened in 1900. This library is maintained and part of the University of Manchester, which was merged together back in 1972. It is open for readers and visitors. The building and the inside of the library is stunning. Definitely, worth a stroll around the old books! What more to say about it. Football fans will know more then me. However, Manchester has two teams and two stadions - Etihad stadion and Old Trafford station. Both stadions are located on one side of the city. There is also a football museum in the centre, worth to note that down. The building is located on the St Ann's Square. Inside the complex you will find a theater and entertainment facilities. The current building is the last of several buildings on the site used for commodities exchange, primarily for cotton. Visit Manchester Museum, if you are interested to see works of archaeology, anthropology and natural history. The museum is owned by the University of Manchester and it is located on Oxford Road, at the heart of the university complex. If you are already around, do stroll around the buildings of University of Manchester nearby. Formally it is called the Cathedral and Collegiate Church of St mary, St Denys and St George is located on Victoria street in Manchester city.,just behind all those shopping and restaurants. The architecture style of the cathedral is Gothic style. Castlefield is a beautiful area alongside of canals of Manchester. It is passing by River Irwell, Quay street, Deansgate and Chester Road. You will find many bars, restaurants or museums nearby the canal. The Castlefield is a conservation historical area and worth to read more about its history and the first railway warehouse and station. The Curry Mile is in Rusholme, located just down off from Oxford Road. It is known for Middle eastern restaurants and shops. Great place to go if you are craving for some Indian. The waterfront destination in Salford, is so called Media City. Known for the offices as BBC or ITV. Besides office building, you can find here also a port, Manchester Dock or Imperial War Museum North. A totally different scenery and vibes around here. An art gallery located just next to Whitworth park on Oxford Road is part of the University of Manchester. The gallery contains about 55,000 items in its collection and always host number of events and new exhibition. There is also a cute coffee shop in the gallery overlooking to the park. Outside of London, you can find Chinatown also in Manhester. It is the second largest Chinatown in the United Kingdom and third largest in Europe. The archway on Faulkner street was completed in 1987. You may find various Asian cuisine around Chinatown, from Chinese, Thai, Japanese, Malaysian, Nepali to Vietnamese. Apart from supermarkets, come here to visit bakeries, shops and supermarkets too. Manchester city is pretty easy to reach by foot. However, number of buses are running in and out of Manchester City. Either purchase a one off ticket or a day ticket, which usually cost around £4, depending on which bus company it is. The cheapest bus company is Magic bus, where you can get around for £1. Check your routes and buses before you travel, as there are no timings nor bus stops written on the stations. Where to eat and drink in Manchester? Where to shop in Manchester? There is an airport, train station or bus station in Manchester. Easily reachable from anywhere. I tend to travel to Manchester from London either by Megabus, National Express or by train. When I used to studied there, flights from Prague was direct to Manchester, which makes my student life convenient. Make your booking though Booking.com and get £15 off from your booking or alternatively, use Airbnb to get more accommodation choices (get £13 off)!